Vault can run in a high availability (HA) mode to protect against outages by running multiple Vault servers. Vault is typically bound by the IO limits of the storage backend rather than the compute requirements. Certain storage backends, such as Consul, provide additional coordination functions that enable Vault to run in an HA configuration while others provide a more robust backup and restoration process. When running in HA mode, Vault servers have two additional states: standby and active. Within a Vault cluster, only a single instance will be active and handles all requests (reads and writes) and all standby nodes redirect requests to the active node. NOTE: As of version 0.11, those standby nodes can handle most read-only requests and behave as read-replica nodes. This Performance Standby Nodes feature is included in Vault Enterprise Premium, and also available for Vault Enterprise Pro with additional fee. This is particularly useful for processing high volume Encryption as a Service (Transit secrets engine) requests. Read Performance Standby Nodes documentation and a guide for more details. This guide will walk you through a simple Vault Highly Available (HA) cluster implementation. While this is not an exhaustive or prescriptive guide that can be used as a drop-in production example, it covers the basics enough to inform your own production setup. This intermediate Vault operations guide assumes that you have some working knowledge of Vault and Consul. For the purpose of this guide, we will use the open source software editions of Vault and Consul; however, the setup is the same for Enterprise editions. The Consul binary is presumed to be located in /usr/local/bin/consul, but if your case differs, you can adjust the path references accordingly. $NODE_NAME this is a unique label for the node; in our case, this will be consul_s1, consul_s2, and consul_s3 respectively. $CONSUL_DATA_PATH: absolute path to Consul data directory; ensure that this directory is writable by the Consul process user. $ADVERTISE_ADDR: set to address that you prefer the Consul servers advertise to the other servers in the cluster and should not be set to 0.0.0.0; for this guide, it should be set to the Consul server’s IP address in each instance of the configuration file, or 10.1.42.101,10.1.42.102, and 10.1.42.103 respectively. $JOIN1, $JOIN2, $JOIN3: This example uses the retry_join method of joining the server agents to form a cluster; as such, the values for this guide would be 10.1.42.101, 10.1.42.102, and 10.1.42.103 respectively. Note that the web user interface is enabled ("ui": true), and Consul will be logging at DEBUG level to the system log ("log_level": "DEBUG"). For the purpose of this guide, the acl_enforce_version_8 is set to false so that we do not need to be concerned with ACLs in this guide. However, you would want to enable ACLs in a production environment and follow the Consul ACL Guide for details. Create a configuration file for each Vault server and save it as /usr/local/etc/consul/client_agent.json. Once the unit file is defined and saved (e.g. /etc/systemd/system/consul.service), be sure to perform a systemctl daemon-reload and then you can start your Consul service on each server. The above output shows that consul_s3 is the current cluster leader in this example. Now, you are good to move on to the Vault server configuration. The Vault server nodes require both the Consul and Vault binaries on each node. Consul will be configured as a client agent and Vault will be configured as a server. 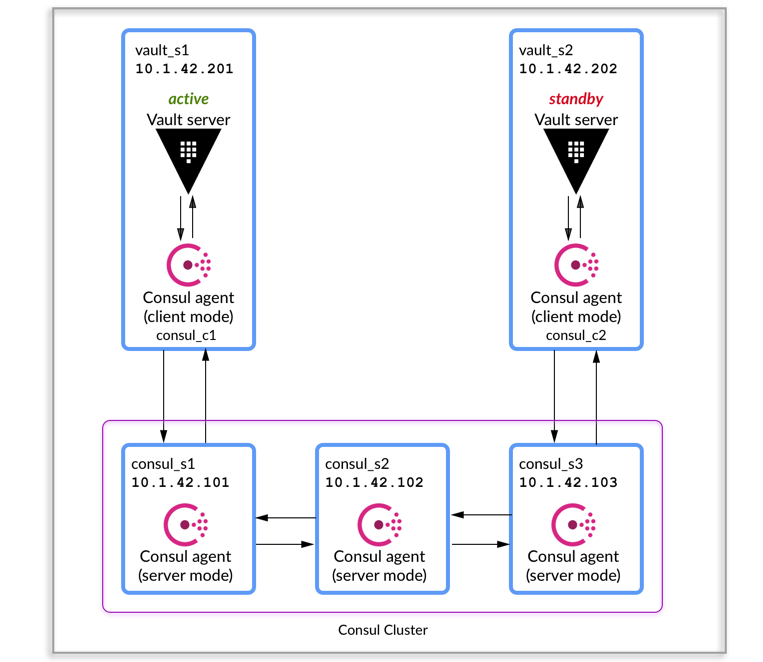 Since Consul is used to provide a highly available storage backend, you need to configure local Consul client agents on the Vault servers which will communicate with the Consul server cluster for registering health checks, service discovery, and cluster HA failover coordination (cluster leadership). Note that it is not recommended to connect the Vault servers directly to the Consul servers. The Consul client agents will be using the same address as the Vault servers for network communication to the Consul server cluster, but they will be binding the client_address only to the loopback interface such that Vault can connect to it over the loopback interface. $NODE_NAME this is a unique label for the node; in our case, this will be consul_c1 and consul_c2 respectively. $BIND_ADDR: this should be set to address that you prefer the Consul servers advertise to the other servers in the cluster and should not be set to 0.0.0.0; for this guide, it should be set to the Vault server’s IP address in each instance of the configuration file, or 10.1.42.201 and 10.1.42.202 respectively. Once the unit file is defined and saved (e.g. /etc/systemd/system/consul.service), be sure to perform a systemctl daemon-reload and then you can start your Consul service on each Vault server. The above output shows 3 Consul server agents and 2 Consul client agents in the cluster. Now, you are ready to configure the Vault servers. Now that we have a Consul cluster consisting of 3 servers and 2 client agents for our Vault servers, let’s get the configuration for Vault and a startup script together so that we can bootstrap the Vault HA setup. address (string: "127.0.0.1:8200"): Specifies the address to bind to for listening. cluster_address (string: "127.0.0.1:8201"): Specifies the address to bind to for cluster server-to-server requests. This defaults to one port higher than the value of address. This does not usually need to be set, but can be useful in case Vault servers are isolated from each other in such a way that they need to hop through a TCP load balancer or some other scheme in order to talk. This configuration allows for listening on all interfaces (such that a Vault command against the loopback address would succeed, for example). We're also explicitly setting Vault's HA parameters (api_addr and cluster_addr). Often, it's not necessary to configure these two parameters when using Consul as Vault's storage backend, as Consul will attempt to automatically discover and advertise the address of the active Vault node. However, certain cluster configurations might require them to be explicitly set (accesing Vault through a load balancer, for example). For the sake of simplicity, we will assume that clients in our scenario connect directly to the Vault nodes (rather than through a load balancer). Review the Client Redirection documentation for more information on client access patterns and their implications. $API_ADDR: Specifies the address (full URL) to advertise to other Vault servers in the cluster for client redirection. This can also be provided via the environment variable VAULT_API_ADDR. In general this should be set to a full URL that points to the value of the listener address. In our scenario, it will be http://10.1.42.201:8200 and http://10.1.42.202:8200 respectively. $CLUSTER_ADDR: Specifies the address to advertise to other Vault servers in the cluster for request forwarding. This can also be provided via the environment variable VAULT_CLUSTER_ADDR. This is a full URL, like api_addr. In our scenario, it will be https://10.1.42.201:8201 and https://10.1.42.202:8201 respectively. Note that the scheme here (https) is ignored; all cluster members will always use TLS with a private key/certificate. Once the unit file is defined and saved as e.g. /etc/systemd/system/vault.service, be sure to perform a systemctl daemon-reload and then you can start your Vault service on each server. Now you’ll need to move on to initializing and unsealing each Vault instance. Once that is done, check Vault status on each of the servers. Vault servers are now operational in HA mode at this point, and you should be able to write a secret from either the active or the standby Vault instance and see it succeed as a test of request forwarding. Also, you can shut down the active instance (sudo systemctl stop vault) to simulate a system failure and see the standby instance assumes the leadership.